Okay, I have to admit something at the start of this piece, at the risk of being shamed by friends and family alike, excommunicated from polite society and left to wander the savage wild (otherwise known as Chestnut Hill). But I have to be honest with my readers, so here goes nothing: I think “La La Land” is just fine. Now, I know this piece may seem contradictory. What about the chemistry between Emma Stone and Ryan Gosling? And what about that killer of an ending? Do I have no heart? The musicals of Jacques Demy are candy-colored, hopelessly whimsical and yet utterly grounded in human feeling. “The Young Girls of Rochefort” is the more classic of the two films, featuring big dance numbers in the town square and a cameo role by none other than Gene Kelly. 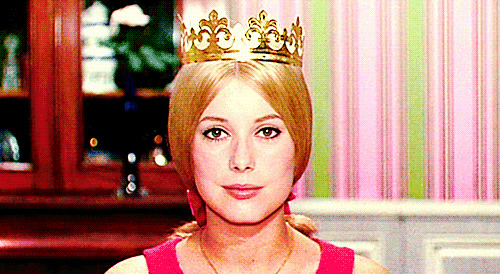 But “The Umbrellas of Cherbourg” is undoubtedly the largest influence of the two films on “La La Land.” “The Umbrellas of Cherbourg” explores the doomed love story of Guy and Geneviéve, and the tragic ending of “La La Land” is pulled directly from the even more tragic ending of “The Umbrellas of Cherbourg.” Demy represents the operatic intensity between the two by having each line in the film sung so that it is more like an opera than a musical. At first glance the influence of this movie on “La La Land” seems negligible. It’s not a musical and it has Adam Sandler in it. But “Punch-Drunk Love” is a kind of musical without musical numbers. The camera swoons and swirls like every scene is a choreographed dance and the film is near constant in its use of Jon Brion’s strange score. The color scheme here seems particularly pertinent in reference to “La La Land.” Sandler’s bright blue suit and Emily Watson’s scarlet dress are referenced almost directly through the solid color costuming of Gosling and Stone. This movie is a classic Hollywood musical. Or it might be the classic Hollywood musical insofar as it glorifies Hollywood as a meritocracy. Hollywood acts in this movie as the benevolent background force, rewarding those who truly deserve it and ultimately damning those who don’t. “La La Land” represents Los Angeles in a similar way, but with more a tragic edge than this movie. Los Angeles also acts as a physical backdrop in this film, with Ryan Gosling and Emma Stone dancing in the hills in much the same way Gene Kelly twists around dripping lampposts at night. Federico Fellini’s “8½” is one of the classics. I actually wrote a 10-page paper on it in my cinema history class, but that’s not what makes “8½” an influence on “La La Land.” What primarily makes it an influence on “La La Land” is the stunner of an opening dream sequence, where the main character Guido is trapped in a traffic jam, suffocating in his car until he floats out of it and up into the air. This sequence is a clear influence on the opening dance number of “La La Land,” where disgruntled L.A. freeway drivers emerge from their cars into an over-the-top sunny dance number.